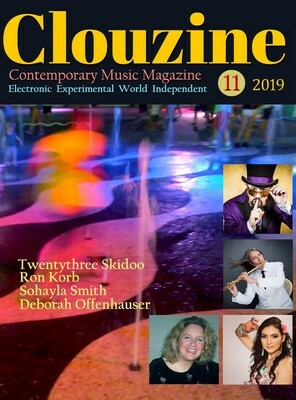 CLOUZINE is an online music magazine covering independent artists worldwide in numerous genres such as Electronic, World, Experimental and Independent. Mentored by Murat Ses and Nihal Ses aka OpBe. Published by Billboard� charted team. Clouzine also gives chance to new/lesser known artists with qualifications, makes interviews, reviews, reports new releases, and much more. In this issue four high caliber international artists were interviewed: Grammy� Winner Twentythree Skidoo (USA), Grammy� Nominee Ron Korb (Canada), Deborah Offenhauser (her music has been on three major television shows: "Desperate Housewives", "Madam Secretary" and "The Big Bang Theory") (USA), and a talented, multi-awarded newcomer Sohayla Smith (Clouzine International Music Awards Fall 2018 Winner) (Canada). Email them at clouzine@yahoo.com for more information.